At this time of year I am happy to eat salad after salad. By this I don’t mean just a regular green salad with a vinaigrette. Rather piles of fresh crunchy vegetables with handfuls of fragrant herbs, texture from seeds or grains, creamy feta, labne or ricotta and all anointed with a punchy dressing designed to bring the components together. I like a classic Nicoise or a retro Coronation as well as the next person and a perfectly made Caesar is a thing of joy. More often though my salads will be veggie based, at once healthy and delicious whilst celebrating the bounty of salad leaves and vegetables spilling from the shelves during the summer months. Tomatoes, courgettes, beans of all kinds, beetroot, aubergines, carrots, peppers either raw, steamed or roasted. Loads of verdant green herbs bringing all their gorgeous flavours to the party and lots of salady leaves. If there is meat or fish it will often be almost as a seasoning, some small cubes of chorizo or bacon for example or salty slivers of anchovy. You will find lots of suggestions here, Green Beans with Tomatoes and Chorizo (September 2013), Christmas Salad (December 2013), Favourite Green Salad (January 2014) and Roast Vegetables with Pomegranate Molasses (July 2014). I turn to all these regularly and honestly, never get bored of them. 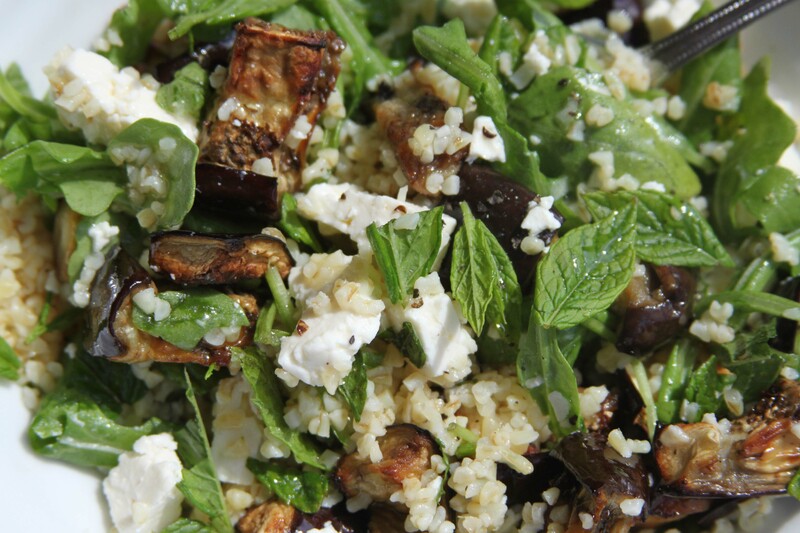 Todays salad is a new kid on the block and celebrates that trinity of good friends aubergine, feta and mint. I often use these ingredients in other dishes but this time wanted them to shine and along with some bulgar for body, leaves of rocket and a garlicky dressing it is a stellar combination. I have mentioned previously my determination to find a way to make all vegetables agreeable to my children but it would seem that aubergine may be my nemesis…..
Preheat the oven to 200, turn the aubergine cubes in the oil and spread out on a baking tray (you may need two), sprinkle with salt and roast for 20-30 minutes until golden. Put the bulgar wheat into a bowl with a pinch of salt and cover with boiling water to about 1cm over the bulgar and leave for 10 minutes. After this time taste a bit, if it is still a little hard leave for a few more minutes before draining. Meanwhile make the dressing by mixing the garlic, honey, lemon juice and oil, season with salt and pepper until you are happy with it. 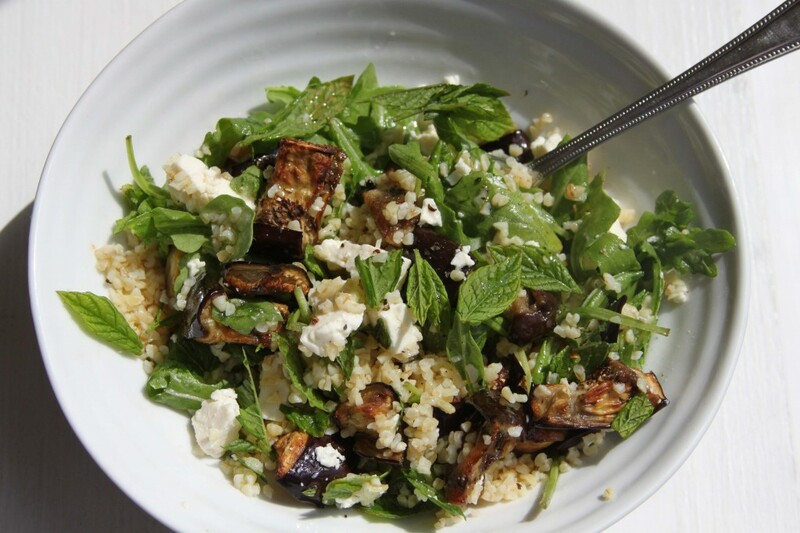 Mix the bulgar with most of the dressing and then gently mix in the aubergine, feta, rocket and mint. Taste for seasoning and just before serving pour over a little more dressing. Serves 4 alongside other things. This entry was posted in Food, Salads, Vegetables and tagged aubergine, feta, mint, roasted vegetables, salad by Anna. Bookmark the permalink. This is fabulous! And gorgeous, in spite of the fact that grilled eggplant isn’t that pretty!!! Exactly, it will never be a looker but what a great flavour!